In below figure, G denotes the gallows and E the elm, B the beech, M1 the first marked location, M2 the second marked location, and S the treasure. Assume that the elm E stands at (0,0), the beech B at (1,0), and the gallows G at (x,y). Then M1 is situated at (y,-x) and M2 at (1-y,x-1). 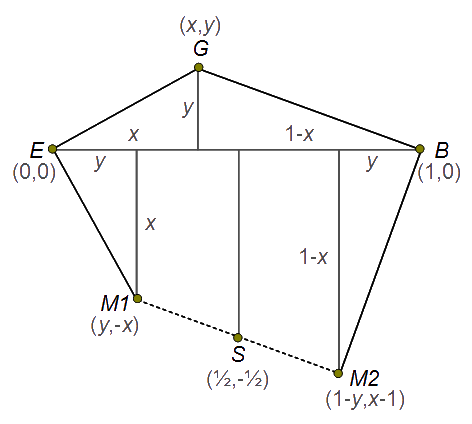 The treasure lies right at the middle between M1 and M2 at( ½×(y+1-y), ½×(-x+x-1) ), which is the same as (½,-½). So, Robert can locate the treasure as follows: he walks from the beech towards the elm and counts the number of steps. Then he walks half of the steps from the elm towards the beech, turns 90 degrees clockwise and walks again half of the steps. Then he is at the location of the treasure.